These Healthy Fudgy Black Bean Brownies are secretly refined sugar free, low fat, high fiber, eggless, gluten free, dairy free, and vegan! I’ve come across so many Black Bean Brownie recipes, but I don’t think I’ve ever been 100% satisfied with one… there would either be too much sugar, too much butter, or too many eggs. All I wanted was a brownie that tasted authentic, sweet and fudgy, like it was from a bakery. I didn’t want black bean taste at all, I didn’t want it to be cakey, I didn’t want it to be bland. I got all I asked for with these brownies! 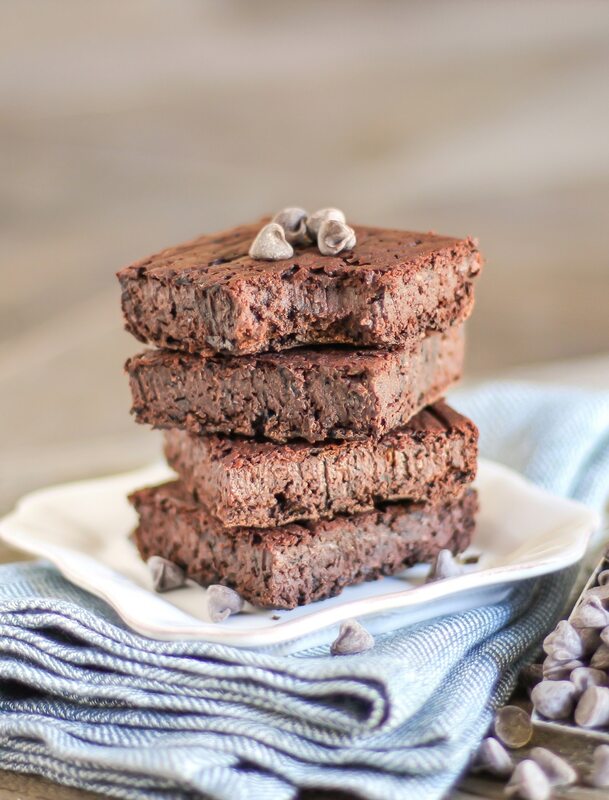 These Healthy Fudgy Black Bean Brownies are super fudgy, super moist, and super chocolatey!! However, it was no easy task… these brownies caught me off guard in so.many.ways. It’s actually kind of ridiculous how many mistakes I made in the baking process, how many things I forgot, and how many things I wasn’t supposed to do. But despite all of my mistakes, the end result somehow turned out incredible. Onto my mistakes, shall we? First, I wanted to bake these using brown rice flour as the combination of rice and beans create a complete protein. However, I ran out of rice flour just last week and had to sub in quinoa flour. Wow, my first mistake and I was already a nervous wreck! This was my first time using quinoa flour and I didn’t know how it would taste or what kind of texture it would provide. I never thought this day would come! A low-calorie brownie that tastes like 1,000 calories… a brownie that is super fudgy yet low in fat… a brownie that is full of flavor yet low in sugar. I seriously couldn’t believe how good these were. Especially after my gazillion kitchen errors. Feel free to grab an extra brownie, no guilt involved! I’m in heaven. These truly taste like bakery-style brownies (especially the corner pieces!). You. Must. Make. These. ASAP! These Healthy ULTRA FUDGY Black Bean Brownies are secretly refined sugar free, low fat, high fiber, high protein, eggless, gluten free, dairy free, and vegan too! Oh yes. these look so delicious! i’m on a diet right now and all I’ve been craving is chocolate cake, chocolate cookies, chocolate brownies, etc and these seem to fit into my diet! is there anyway i could use all stevia instead of Granulated Erythritol? I’m sure any other granulated sweetener (like stevia) may work in place of the erythritol, but I wouldn’t recommend using liquid stevia. The erythritol adds denseness and a good texture. As long as it’s a granulated sweetener, I’m sure it’ll work. Good luck! Oooh these look magnificent. 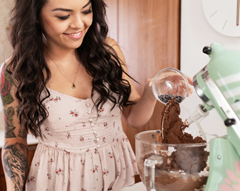 Chocolate is my weakness… Can I sub the quinoa flour for any other type of flour? I gotta get some grapeseed oil, I don’t use canola either. It’s either olive oil or coconut oil in my cupboard. And Jessica, I swear, you have got to be one of the onl people who are lucky enough to “mess up” while creating a recipe but yet it turns out splendid anyway! It’s never worked like that for me 🙁 Sad face. I’ll let you know how it goes when I make these. I have a can of black beans in the cupboard just waiting to be used and I’ve been searching for a good recipe. These look amazing! I haven’t found an egg-free black bean brownie recipe that looks this good – until now. This is on my “to make” list! Hi Jessica! I just found your blog on food gawker and I am obsessed with your recipe!! I’m so excited to dig through the rest of your site 🙂 These brownies look so good! Have you tried anything other than the Quinoa flour? I’m wondering if regular flour would work? I haven’t tried freezing these but I’m sure they can. I would tightly wrap them and leave them at room temp overnight so they’ll be ready to eat the next day. This works with my pound cake recipes well, so I would assume this would too. How did you create the nutrition facts label? I’d like to do that for some of my own recipes. I found a couple of sites that analyze recipes to give you the calories, fat, protein, etc., but I haven’t found one that gives the standard nutrition label like you provided. Thanks so much, Jessica! I’m testing out these brownies tomorrow. Can I sub applesauce for the pureed blueberries? And would I use the same amount? I find that blueberries are a little thicker than applesauce, so if you use applesauce maybe use about 7 tbs (or 1/2 cup – 1 tbs). Hopefully this works for you! I’ve never used amaranth flour before but I don’t see why you wouldn’t be able to use it. If you can, use amaranth flour to replace the quinoa flour only and not the oat flour… but if amaranth is all you have I really hope the brownies works out! Hi Gabrielle! I’m so glad you are doing a bake sale for the Heart Foundation, kudos to you 🙂 And yes, you can use sugar instead of erythritol at a 1:1 ratio. Sorry, stevia can’t replace the erythritol here. 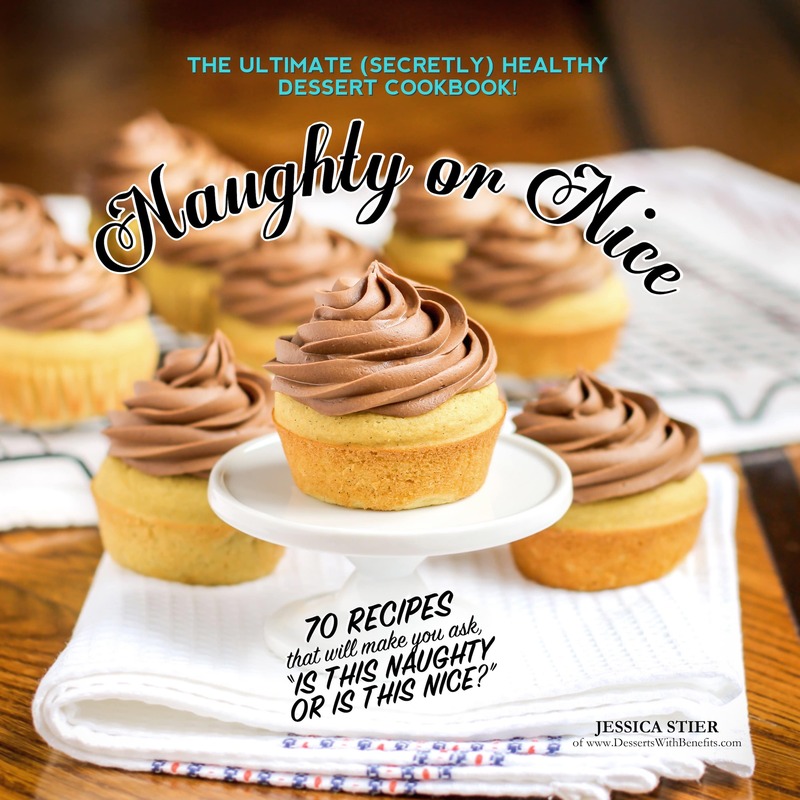 Erythritol adds bulk to the recipe, just like regular sugar would… you can try it out if you like, however you might need to add an extra tablespoon or so of flour or cocoa. OK, so I made these brownies tonight and they were sooooo good! Chocolately, fudgey, with a slight crust on top…..yum! They had a very similar texture to regular brownies. The only regret I have is not making two batches! My kids couldn’t get enough. The only change I made was I used pumpkin puree instead of blueberries. I also added about 1/3 cup of chocolate chips. I will certainly be making these again and again and again….you get the point. Thanks for such a wonderful recipe! Sorry, forgot to add that I used coconut sugar instead of Granulated Erythritol, didn’t use the instant coffee, used coconut milk instead of almond milk (due to nut allergies) and used olive oil instead of canola. I guess I did make a few more alterations than I mentioned before but they still turned out great! Hey I love your blog and I can’t wait to try some of these recipes! This one is very exciting, but for religious reasons I don’t drink/eat coffee. Is there something else I could substitute? A handful of chocolate chips in the batter will compensate for that! I’m so glad you liked the recipe 🙂 And using pumpkin instead of blueberries sounds amazing, I need to try that. Thanks Amanda! Disclaimer: I like healthy desserts, but TASTE is always top priority for me. I have tried the “chickpea cookie dough” recipe bouncing around the Web and thought it was the most disgusting thing on Earth. However, I built up the courage to make these, and THEY ARE INCREDIBLE. I prefer them to regular brownies. SOOO good. I used just 1/2 cup cocoa powder, since that’s all I had, replaced the erythritol with sucanat and the quinoa flour with spelt, subbed the pureed blueberries with one pureed and peeled apple, and stirred in about 3/4 cup of chocolate chips. HELLO AMAZING. I think the chickpea cookie dough is definitely a bit controversial taste-wise. I love it, my sister hates it, my friend likes it, another is unsure. But, as for the brownies, I’m so glad you liked them! These look amazing, I have to make them! But, as I can’t find Quinoa flour where I live, do you think I can substitute it for Almond flour? I’ve not used Almond flour before and I’m not sure if the almond taste would be too overpowering, kinda like with Coconut flour. I’m sure almond flour will work and won’t provide a strong flavor, seeing as the recipe only calls for 1/4 cup. Hope you like the brownies! I wouldn’t recommend coconut flour because it absorbs a lot of liquid and would make the batter too dry. I would recommend oat flour or brown rice flour. Hope this helps! I am SO VERY HAPPY to have found your blog. Thank you for every single recipe. I can’t wait to try them all! my brownies are different on top…but normal brownie consistency on bottom. I’m not sure why your brownies turned out not very sweet. In the directions, I say to flip the brownies onto a cooling rack “top-side/ugly-side down.” You should serve the brownies upside down because they are better looking that way. I have never used granulated stevia, but I would say that is the only plausible reason why your brownies aren’t sweet. Brown rice flour should work well as a quinoa flour substitute, I have used the two interchangeably in my personal experience. 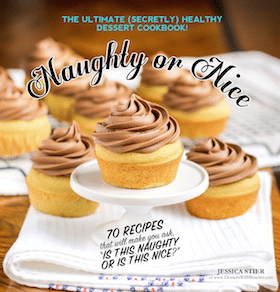 Hey Jessica, thank you for all your amazing recipes ! However I’ve made these twice now. I thought of maybe adding bananas. What other alterations would you recommend if I decide to try with bananas? Do you think I’d need more flour, or more liquid maybe, almond milk? Thank you Jessica! I tried it today and it turned out really good – I added a topping of melted coconut oil with almond butter, cocoa, dark chocolate chips and some raw honey, which made them even sweeter and sooo good. BTW, to the person who commented that the brownies turned out black not brown – this happened to me too, and it’s probably because of the baking soda (of all things). Whenever I put baking soda and blueberries together, it makes the blueberries reeeeeallly blue, not purple, and dark, so combined with black beans I guess that’s what makes them black. Hi Jessica, my sister made these for my family at Christmas and we all LOVED them. Now I’d like to make them again, but I am trying to stay away from all refined sugar. Could I substitute raw honey for the Erythritol? New to this blog, yummy recipes, ESP for us GFVs! I wonder if I could sub coconut oil for the canola oil (GMOs)? 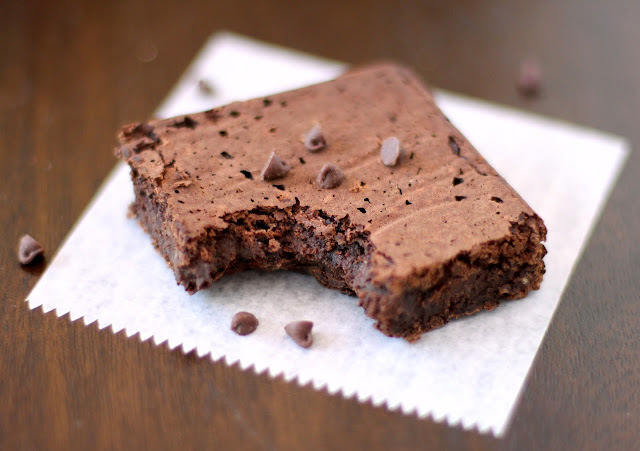 Read about blk bean brownies but have never tried them. I was so hoping they’d turn out great – but they didn’t firm up even after hours of cooling and they’re totally not sweet, even though I added some extra granulated stevia (1/4cup or so). Too bad, but I figure I could still turn them into cake pops or crumble them into some soy yogurt, add extra sweetener and/or banana and they’d make a great & healthy snack. I’m so sorry the recipe didn’t work out for you! Did you use all of the same ingredients or make any substitutions (besides the additional stevia)? 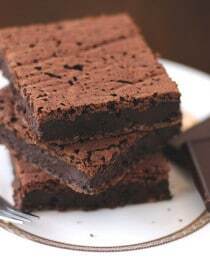 I found your website and I really want to make these brownies.. they look so good! I was just wondering if I could substitute the blueberries for raspberries as blueberries are really expensive where I live. I haven’t tried these brownies with raspberries but I’m sure that will work just fine!! Just be sure to mash the raspberries beforehand and strain the mixture through a fine-mesh sieve to remove all the seeds 🙂 Hope you like the recipe! I’ve wanted to try a black bean brownie for sometime now. Just made these tonight and I’m kicking myself for not making them sooner! To be totally honest, I used xylitol for sweetener and didn’t actually have enough so used organic sugar for the rest, so not totally low sugar but these were still fantastic and I’m sure way healthier than a regular brownie! I took them to a holiday party tonight and got rave reviews! Will definitely be making these again!! I notice that a lot of your chocolate recipes have coffee in them. Is there anything I can substitute for the coffee? Started following you on IG recently. i follow a lot of people who post healthy recipes But since the time i have started following you, i have really fallen in love with your posts. i am not too much in cooking, but this recipe really urges me to try it. I have a few queries though, IT’d be great if you could answer these. 1. Don’t think i’ll manage to get Quinoa Flour, SO as you’ve written above i can replace it with whole wheat flour. 2. i am sorta allergic to flaxseeds. WHat could be a substitute to that. 3. Blueberry Puree :- Could this be replaced with Fresh Banana/Apple/ Or any other fruit puree as we do not get blueberries in our local market. 1. You can replace the quinoa flour with whole wheat flour (or whole wheat pastry flour, if you have it! ), or even oat flour. 2. You could substitute the ground flaxseeds with ground chia seeds. 3. The blueberry puree can be replaced with applesauce! And to answer your later comment, chickpeas or cannellini beans would work, but the color might not be the same. And to add to the above, what difference will these substitutes make to the Calorie count? Well We do not even get Black beans in India. Phew. I Loveddddddd The recipe. Everyone at my home loved it too!! But i replaced quite a lotta things but still turned out Super Amazing. Honestly i was myself doubtful, on how can you have a good brownie with Chickpeas in it but i am glad i proved myself wrong.. haha. Thank you! They are in the oven right now! I am so excited 🙂 I cut the recipe by 2/3 because I only had a small amount of some of the ingredients. I used chickpeas and I used a scoop of chocolate circle of life protein powder (it’s very similar to sun warrior) instead of the quinoa flour. I used powdered and liquid stevia instead of ethrytol and coconut oil instead of grape. So quite a few subs but I hope they turn out! The batter tasted amazing so I’m waiting anxiously 😀 I will let you know how they turn out! I hope you liked the brownies!! Okay so they turned out a little interesting XD the texture was nice, gooey on the inside and crispy on the outside. The taste was good at first but then I started getting this bitter aftertaste. I’m guessing it might have been from the stevia since it sometimes gets weird when baked. I’ll have to try to ethrytol next time if I have some. I also think if you do add the protein powder still keep a bit of flour in the mixture because although the texture wasn’t bad I wish they had been a little more cakey. It turned out a bit more like fudge than brownies. I will definitely experiment a bit more with this recipe! I’m glad the texture was good! But yeah, stevia alone can taste a little off. 1. Are all beans incomplete proteins? I know that soybeans are complete, but are there any other? 2. Could you mix beans with brown rice protein powder to form a complete protein? Or is brown rice protein powder already a complete protein? 3. Is there such a thing as bean protein powders, if not, why hasn’t someone come up with that yet? It’s such an obvious choice :), also, there could be brown rice pp mixed with bean pp to form a vegan complete protein powder! 1) Beans are incomplete proteins and need to be paired with a complementary food to be considered complete (for example, brown rice, oats, peanut butter, etc.). Soybeans and some other vegan foods, like hemp seeds, buckwheat and quinoa are complete proteins. The only difference between vegan complete proteins and animal proteins (milk, yogurt, eggs, chicken), is bioavailability. Animal proteins are much more bioavailable to our bodies and digestive system (~80-100%) than vegan proteins (~40-60%). 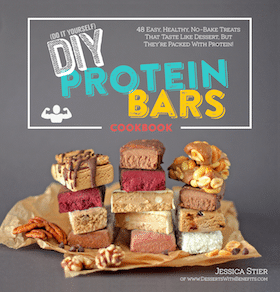 3) I’ve heard of black bean pasta and soybean pasta, but not protein powder… sure sounds like a great idea! I mean, I’ve seed chia, hemp, and even quinoa protein powder before! As for the quinoa flakes, I’m not sure why that didn’t work. Maybe quinoa flakes absorb more liquid than quinoa flour? 3/4 cup of erythritol is equal to 18 packets of Truvia. I tried quinoa flakes and thought if I just blend everything in the blender it would work, It didn’t 🙁 But I was wondering if you knew why? I used 3/4 cup cocoa, but they don’t taste chocolaty? What do you think the ratio of erythritol to truvia (packets, not spoonables) would be? And whenever I use pumpkin puree (and also blueberry puree), the batter always had a funny smell, and sometimes it would bake out, sometimes not, does yours do this? This brownies look delicious 🙂 can I leave out the baking soda, I can’t find it in Austria, and would this change something? Baking soda is important for the texture, so I wouldn’t recommend omitting it. Have you looked for baking soda online? Or have you found baking powder? Baking powder might work in place of the baking soda.